Look at those Victory Rolls! 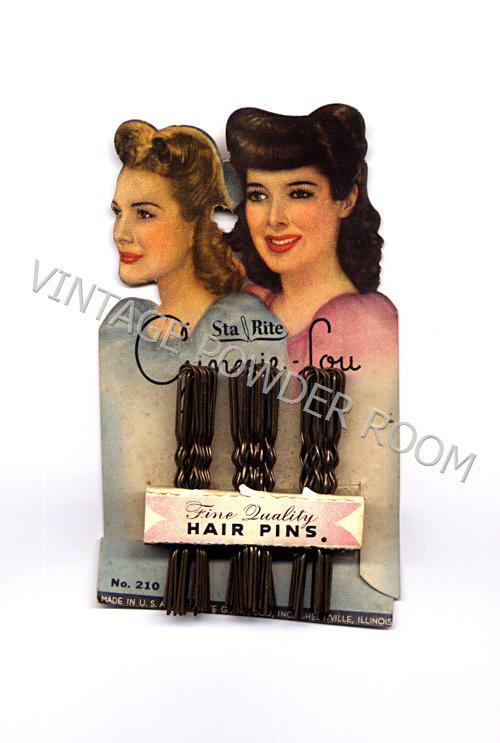 If there was a third woman on the hairpin card they could be the Andrew Sisters. LaVerne, Maxene, and Patty began performing when they where kids and they won first prize at a talent contest at the Orpheum Theater in Minneapolis. 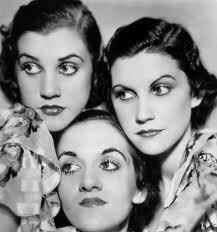 The sisters got their professional start touring with Larry Rich and his 55 member troupe. They quit the troupe in 1932 and began touring on their own. They performed at fairs, vaudeville shows, clubs and they would often rehearse in the back of their father’s Buick while on their way to the next gig. The sisters lived on the road for six years before their first major success with “Bei Mir Bist Du Schoen” (“To Me You Are Beautiful”) which charted at the top of the U.S. Billboard for five weeks. The Andrew Sisters had become celebrities. Their backseat rehearsals had paid off. The 1940s brought enormous sucess to the Andrew Sisters. They appeared on the radio, in 17 Hollywood films, and earned $20,000 a week! That is $328,000 in current USD — not exactly chump change. But the sisters weren’t just about the money, they were patriots and participated whenever they could in wartime entertainment. In June 1945 they were a featured act in an eight week USO tour and performed for thousands of servicemen. As harmonious as they were on stage, sadly the sisters were occasionally in conflict with one another. They broke up for the first time in 1951 because Patty had joined a different group, with her husband as her agent. It may not have been such a big deal if Maxene and LaVerne hadn’t first learned of Patty’s defection in a newspaper gossip column. In 1954, Patty decided to pursue a solo career. She was good, but she couldn’t duplicate the success she’d had as a part of the sister act. Maxene and LaVerne formed a duo and were well received, but the truth is that the 1950s were shaping up to be a much different decade than the 1940s had been. 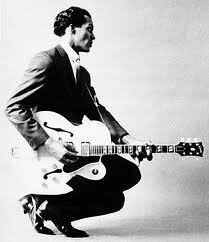 Rock ‘n Roll was gaining in popularity and the audience for music was changing. A show called BANDSTAND premiered locally in September 1952 on a Philadelphia television station. The sisters couldn’t compete with newcomers like Chuck Berry and Elvis Presley. LaVerne (the eldest of the trio) died of cancer in 1967. It was LaVerne who had founded the original group and she was frequently the peacemaker when there was a falling out. Maxene and Patty performed together for another year before Maxene announced she would become the Dean of Women at Tahoe Paradise College. Patty was again a soloist. When Bette Midler had a hit in 1972 with “Boogie Woogie Bugle Boy”, Maxene and Patty made something of a comeback. Maxene and Patty had their last hurrah with the 1971 reveue “Victory Canteen”, but when Patty’s husband brought a lawsuit against the show’s producers an extensively scheduled road tour, which included the sisters, was quashed. Patty and Maxene reunited on October 1, 1987 when they received a star on Hollywood’s Walk of Fame; but the reunion was short-lived. The sisters would never again be close. Maxene died of a heart attack on October 21, 1995, and Patty died today, January 30, 2013, at age 94. I had no idea when I began this post that Patty had just died. I find that a bit unsettling.